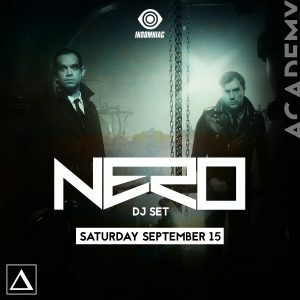 Tickets & Guestlist for Academy LA, Avalon, Exchange LA, Time OC and more! Nero say that they’re best known for ‘Ragga Puffin’, but they’re possibly being a bit modest here (as they are almost certainly being ironic when they say that the Future of DJing is Paris Hilton). They first shot to notoriety – in drum & bass circles anyway – with their 2005 release ‘Ragga Puffin’ on DJ SS’s Formation offshoot Reformed Recordings, a track with an epic intro that would only hint at what was to come from this hugely talented production/DJ duo. Daniel Stephens and Joe Ray had a No.1 single in the UK with ‘Promises’ in August this year, and simultaneously held the No.1 album slot in the UK with ‘Welcome Reality’. These immense achievements – as well as supporting and remixing Deadmau5 – marked the culmination of Nero morphing from a d&b act through Dubstep and into all-conquering EDM. Dreamy banger ‘Innocence’, featuring Alana Watson on vocals, was their first big dubstep record on MTA Records, the label run by Chase & Status, another junglist duo who broadened out their palette to embrace other musical styles. And they haven’t really looked back, having bigger and bigger hits with ‘Me & You’, ‘Guilt’ and then ‘Promises’ as 2011 progressed. Dress Code: Fashionable Attire. No Sandals, No Tank Tops, No Shorts, No Baggy Attire, No Offensive Graphics, No Backpacks. Sign up to receive weekly emails with hook-ups on shows happening this week!